This one is a bit larger that what I've been posting. Here are a couple of white-petaled daffodils from my garden. This painting was done using a double primary palette - meaning a cool and warm of each of the three primary colors. This palette makes for a painting with stunningly fresh and beautiful colors. 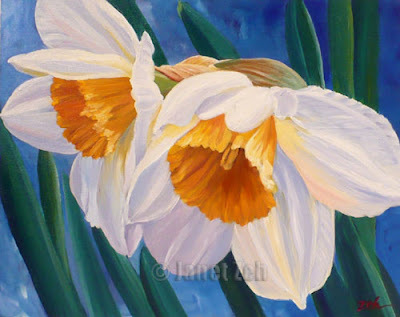 This original oil on canvas painting is size 16"x20" on gallery wrap painted edge canvas. You do not need to frame this painting as it has a deep painted edge with the colors and image carried over onto the sides. You can see my flower artwork at zehoriginalart.com. Thanks and have a beautiful day.